Robot vacuum cleaners are becoming more and more popular because of the modern fast-paced lifestyle. But among the various brands of robot vacuum cleaners on the market, some frustrating phenomenon is very common: irregular cleaning route, frequently trapped or stuck, incomplete sweeping, loud noises, big sizes, high price, etc. Based on this reality, Alfawise recently released a new robot vacuum cleaner, Alfawise V8S. Among all the robot vacuum cleaners, Alfawise V8S is the most powerful one with the price a quarter cheaper than similar products. Smarter mapping: this cute little cleaner can think. When a person enters a room for the first time, he or she will scan the whole room with eyes and plan the path quickly based on his or her current position. Alfawise V8S uses artificial intelligence to simulate this process. Equipped with double SLAM positioning system, gyroscope and position sensitive detector(PSD), Alfawise V8S can sense and maintain direction. The PSD system, which is used in a vacuum cleaner for the first time, helps Alfawise V8S to knows its accurate position in the room including the height between itself and the ground. That’s why V8S can make decisions by itself: how fast, what obstacles to avoid, where to start the zigzag cleaning, how to reach the specific area, etc. Mapping and positioning systems are the core technology for a robot vacuum cleaner, thanks to them, Alfawise V8S will complete the whole process of mapping, planning routes and starting cleaning in an instant, and continuously adjust itself in the process of cleaning. With all the industry's top AI technologies, V8S can clean your room without any blind spots and charge back by itself, all act like a cute little person who has thoughts. Power suction: powerful energies contained in the small body. Alfawise V8S is a very mini-sized vacuum cleaner, only 8cm thick, slim enough to get under most sofas or beds to clean the hard-to-reach corners. But meanwhile, don't underestimate it because of the size. V8S uses brushless DC inverter motor, providing a 880-1300Pa strong suction and 10 times service life of ordinary motors, no matter seeds, rice, beans, hair or other small crumbs that should not appear on the floor, can be easily cleaned out. This makes V8S a must-have for pet owners or toddlers’ parents, because it can effectively remove pet hair from the floor to prevent allergies, avoid children injuries due to small pieces and let you enjoy the happy time without being trapped by housework. More than that, Alfawise V8S has the working noise less than 65dB, no need to worry about waking up your families when cleaning. Intelligent obstacle avoidance: leaves you with a worry-free quality life. In order to completely liberate your hands, Alfawise V8S is designed to solve all the problem by itself. 3 modes on the remote control, edge, spot and planning is designed to suit different cleaning needs: clean corners, dirty areas or the entire room. It will clean every corner of your house and go back for charging when the cleaning is finished or the battery is not sufficient, you’ll barely notice it. The intelligent obstacle avoidance ensures that the robot vacuum cleaner will auto go round furniture to prevent bumping or scratching. With the 3 sensors at the bottom and the 5 sensors in the front, V8S is able to climb over a 15 degree slope and doesn’t fall down stairs or tumble over drop-offs. 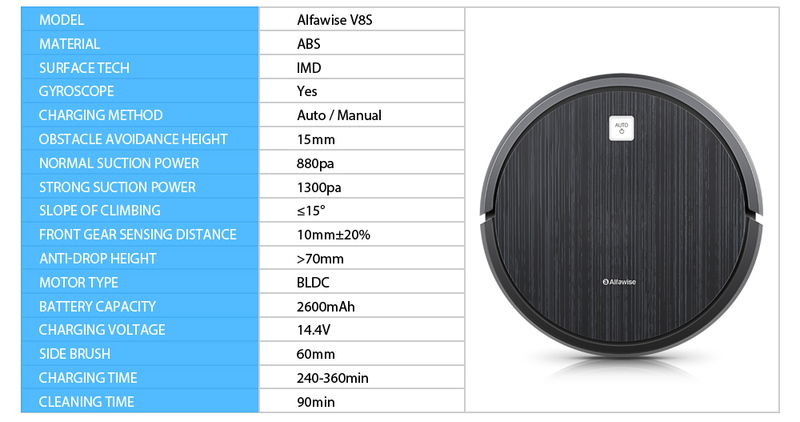 Not only that, focusing on the core functions for a robot vacuum cleaner, Alfawise V8S is much more affordable than most similar products. As a cost-effective robot cleaner dollars, V8S perfectly achieved the highest cost performance and best user experience. In conclusion, plenty of robot vacuum cleaners are good now, but none of them perfectly achieves the balance between smarter system / algorithm and the affordable price like Alfawise V8S does. Equipped with the top gyroscope, PSD, brushless DC motor and up to 1300pa suction, Alfawise V8S is your best choice for a smart vacuum cleaner at an affordable price. Now let’s have a look at the specifications.